After the success of Bench earlier this year, Theatre Onset returns in May, uniting with In Theatre for Promise, a funny, tender, vibrant and moving play by English playwright, Megan Barker and directed by David Stocker. 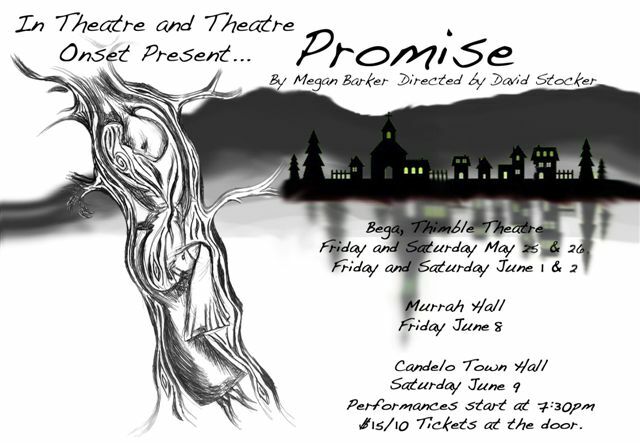 Involving a large cast of adults and students and intricate staging, Promise tells the story of a small town set upon by scavenging media hordes determined to beat up a news piece about a teen suicide cult. They’ll stop at nothing to tell the tale their editors and producers want them to tell. They certainly won’t let the facts or the feelings of the town’s young people or their families get in the way. Introspective high schooler Jay Jones stays quite literally above it all, spending as much time as he can alone atop a tree which holds many memories for him. Jay feels alienated from his family and misunderstood by his peers until he meets the mysterious Asha and a careful love story begins to unfold. Timely and intelligent, featuring some of the best theatrical talent the valley has to offer, Promise is an unforgettable drama that is most certainly not to be missed. Promise opens at the Thimble Theatre , Bega High School on Friday 25th May, with performances on Saturday 26th May, and Friday 1st and Saturday 2nd June. The show then travels for one night only to the Murrah Hall on Friday 8th June and completes its season at the Candelo Town Hall on Saturday 9th June. All shows start at 7:30. Tickets $15/$10 and are available at the door. Recommended for 14 years and above.